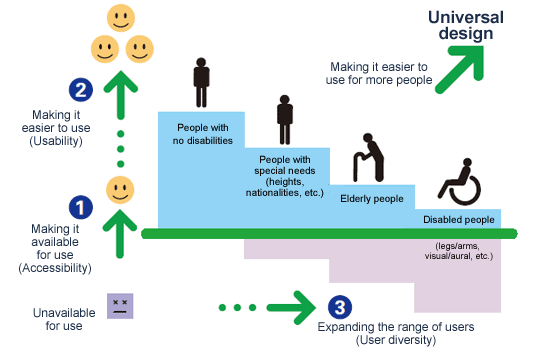 I remember the day I learned about Universal Design. A framework whose influence extends (and originates) far beyond education. I have attended numerous workshops since, but the one example that still resonates with me, is the image of the ramp in construction and building design. I am quickly taken back to the high school I attended. A monstrous brick building constructed in 1957, housing over 2000 students in central Alberta. I remember being in grade 10, when construction was being done to retrofit a stairwell to accommodate a student attending who was in a wheelchair. The commotion (and cost) that this created made it obvious to even the students, as to why this wasn’t considered in the original plans of the building. This exact idea is the main principle of Universal Design. We would be hard pressed to find a building constructed in recent years without a ramp or an elevator designed in the blueprints from the beginning, assisting not only the users in wheelchairs (who the supports are designed for) but also benefiting mothers with strollers, 12 year olds with skateboards and dogs with sore hips. If you extend this metaphor to represent learning in schools, teachers become authorized to view supports and strategies which may have been designed for one learner, but can aid in supporting many learners. I was fortunate this year, to work with a lovely Kindergarten class in Richmond, British Columbia. I spent a couple days with this group, including attending my first 100 day party (and even made my own hat)!! I remember drawing trees resembling that of Dr. Seuss, with a single strip of blue sky along the top of my page in Kindergarten, but this class was like a kindergarten wonderland. Paying particular attention to the emotional development of her students, this young teacher is already a master at fostering cooperation as well as self reflection in her 5 year old companions to promote conflict resolution and social responsibility in these little humans. 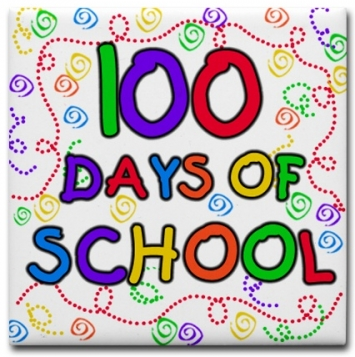 On one particular day, I was there to observe the centres in the afternoon (which by the way should totally have a place in classrooms WAY beyond kindergarten!) Kids flocked to the sand table, unpacked the plastic fruit from the house corner, built un-wavering structures from lego, raced timeless toy cars and cozied up in a corner with a pillow and a picture book. 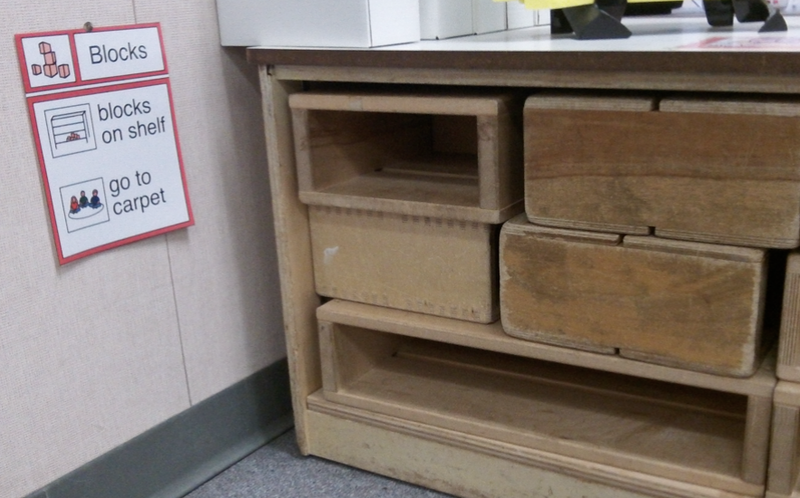 All students engaged, not with pencils, papers, chairs and tables… but with play. I was called in to observe and support one little guy , who was identified with special needs. As with many students, explicit instruction in social skill development is beneficial, and often students need additional attention paid to structure and opportunities to practice these skills. What I noticed immediately, however, was how the teacher utilized these strategies to support not only her student with special needs, but how she used these strategies to support ALL of her students. 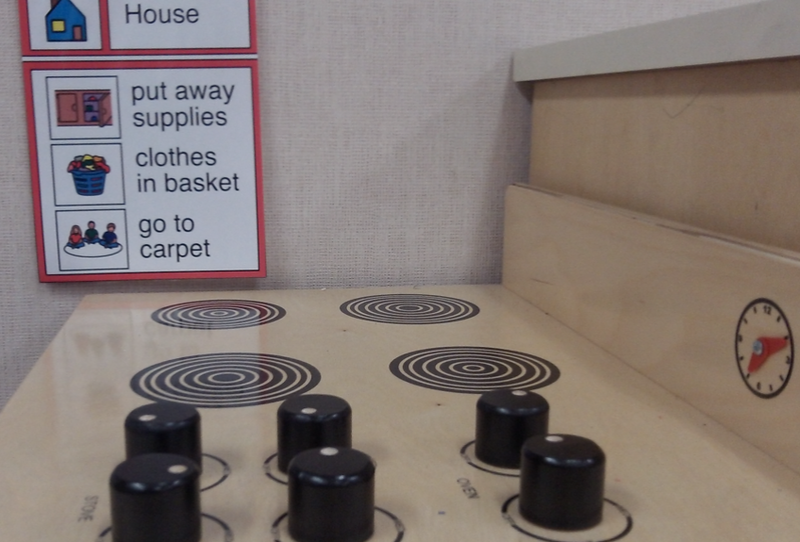 Examples of these Universally Designed practices were all over her room. Visual count down clocks, transition strips and clear visuals were available for everyone to see and use. 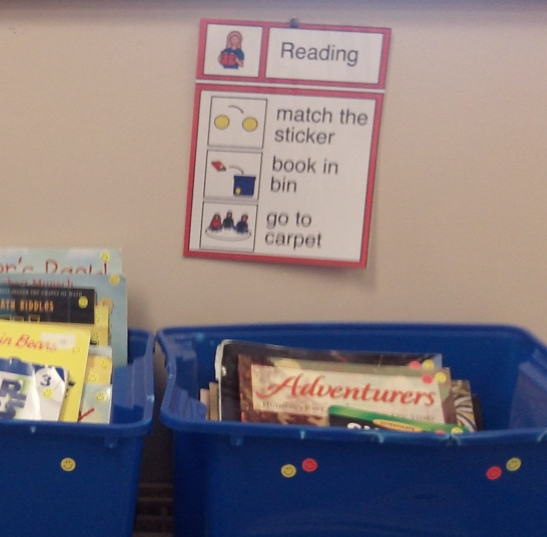 Choices offered to students for centres and where to sit, allowed students to start managing and recognizing what supports they need, and promote this beginning self regulation of their own learning. What was also important to note was that none of these supports included an educational assistant. The “assistant” instead, was in the design of the class. To further support this particular identified student, we thought that some additional steps in “how to clean up,” centres beyond the general class clean up cue would be helpful. We decided that having an additional visual cue outlining clean up procedures in no more than 3-steps, could help facilitate this student to be clear about the expectation, and as well, prevent some behaviour which was occurring during this less structured time. It didn’t take long, however, to realize the benefit to not only this student, but to all the students, again reinforcing the teacher’s commitment to responding to the needs of her diverse learners. What I loved about visiting this class, even in my short time with them, was the clear philosophy regarding diversity. Immediately seeing benefits of supports and how they could be used to in terms of all students’ learning, there was no concern (or air time) for un-fairness, or the “othering” mentality of us vs. them. This class is a great example of a teacher simply educating her students… all of them and a working model of inclusion. Universal Design is a philosophy, and (I am convinced) once adopted, both a more effective and efficient means to educate students. There are so many retrofitted lessons and activities surrounding us as educators; and just as archaic brick buildings are modified, trying to force students into pre existing formulas and structures, can be costly and disruptive. These students are fortunate to benefit from such a clear rationale of supporting diversity; learning from each others’ strengths and responding to their stretches, regardless of label, category or funding allocations. A big thank you to this class, for reaffirming, despite our year of tensions and over stretched resources, that meaningful inclusion is possible. For more information on Universal Design for Learning, CEC (council for Exceptional Children) has published a great reference text.